Naples-based EBL Construction has begun construction at The Ranch Club swimming pool complex at Boot Ranch, a luxury golf course community located in Fredericksburg, Texas. Shown here, the site infrastructure and pool shells have been completed, as the project is being expedited for a Fourth of July ribbon-cutting ceremony. The project consists of the addition of a pool clubhouse, a 6,000-square-foot, resort-style pool, tennis courts and pavilions. EBL is providing construction management services for the project. 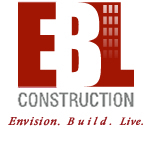 EBL Construction has completed over 250 condominium residences in the past three years throughout Florida and is currently engaged in projects in New York, Florida and Georgia. A division of EBL Partners, an established construction and project management firm based in Naples, EBL Construction provides construction and residential renovation services for clients throughout Florida and across the country. The company’s experience profile includes the successful completion of projects in various sectors, including commercial, hospitality and residential. With a reputation for consistently meeting and exceeding the needs of their clients, EBL delivers unmatched build-out services and ensures the highest attention to detail at every stage of development.